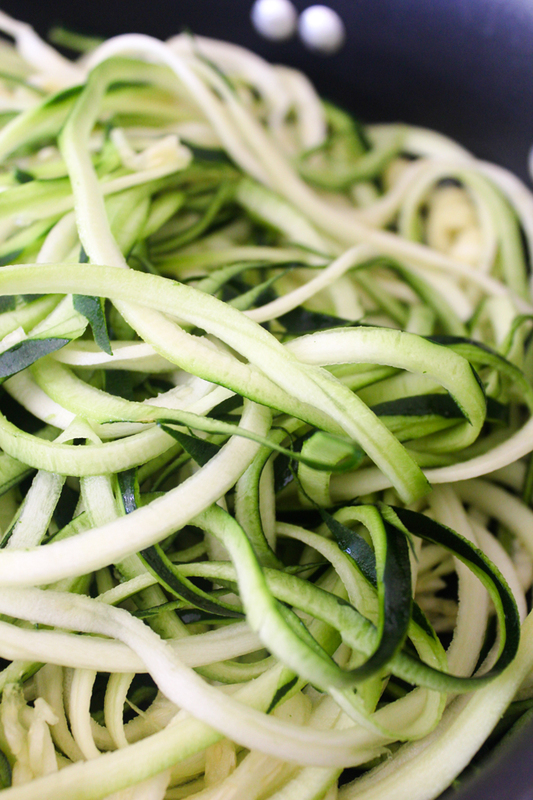 As you might have noticed from this post, I'm totally in love with my spiralizer, and this dish proves I have good reason to be. Eating light for dinner in the winter can be especially challenging. After a long day of work, all I want to do is eat something warm, comforting and filling while relaxing at home. It's hard to find a meal that fills this criteria but is still healthy and doesn't make me feel weighed down. 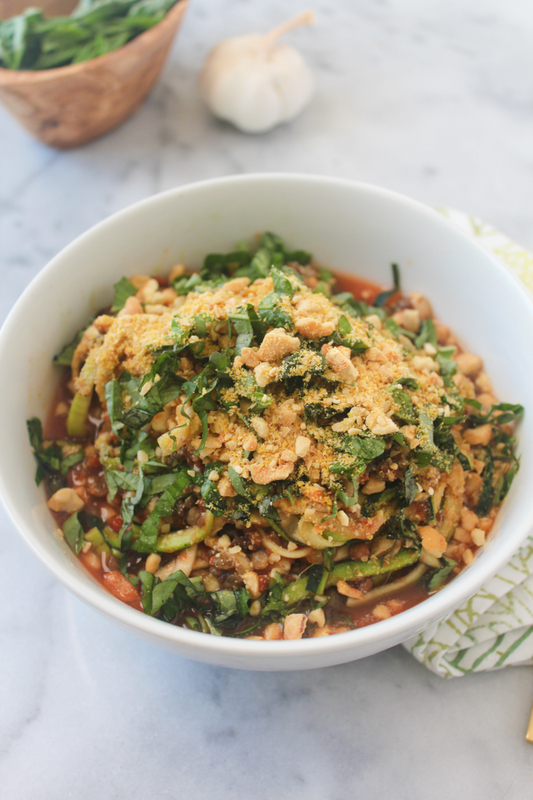 This Zucchini Spaghetti meets all of the above, which is why it's become one of my favorite weeknight dinners. 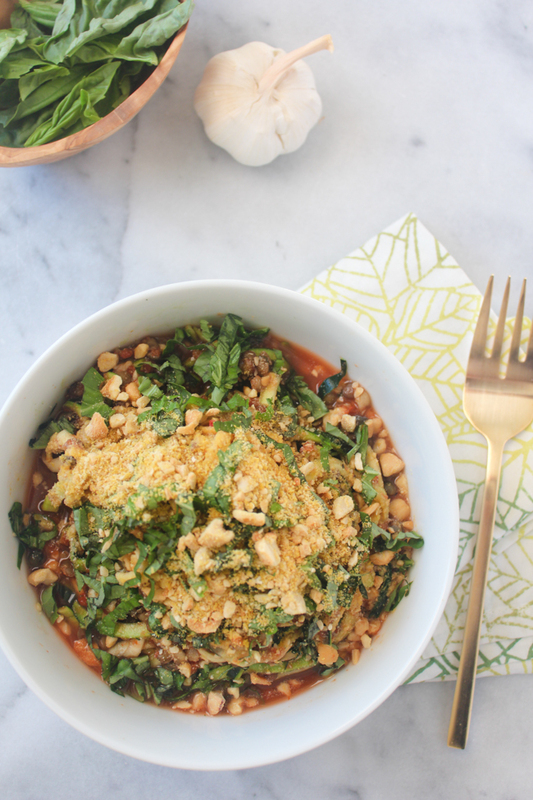 There's so much veggie goodness, it's almost like eating a salad, but you still get the comfort element from the warm, rich marinara sauce and the lentils, which are full of protein and fiber, will completely fill you up. I'm the first to admit that cooking period on a weeknight can be challenging, so it's totally fair to just use store-bought marinara sauce to make this dish if you're not feeling up to making your own. Honestly, that's what I end up doing more often than not because this meal literally takes less than 10 minutes to throw together if you go that route. Although, if you do have an extra 15 minutes to spare, make the sauce. It's worth it. One thing you do not have permission to skimp on is the Cashew Parmesan. This. Stuff. Is. So. Good. I'm not exaggerating when I say I put this parmesan on everything from soup to salad to avocado toast to rice to oatmeal. Everything. It's so easy and is perfect for making in big batches because it keeps in the pantry for a few weeks so feel free to double or triple the recipe below. If you visit S & S regularly, you've probably noticed that I reference Trader Joe's products and sizing in a lot in my recipes. That's because I buy 90% of my groceries there. I love the experience and prices at TJ's, but one thing I find challenging is their nuts. They only sell them in bulk bags, which is awesome in the sense that you get a lot for a relatively low price, but can be difficult when trying to figure out how to use that many before they get stale. This parmesan is the perfect remedy for that. 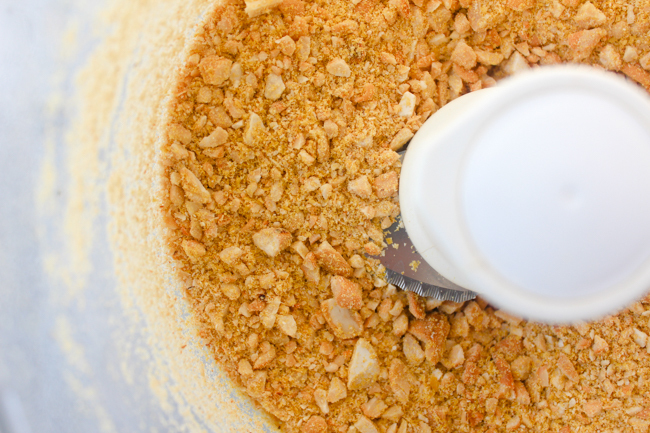 Just throw the cashews in your food processor with the nutritional yeast and a bit of garlic powder and it you've got something so delicious it definitely won't stick around long enough to go bad. 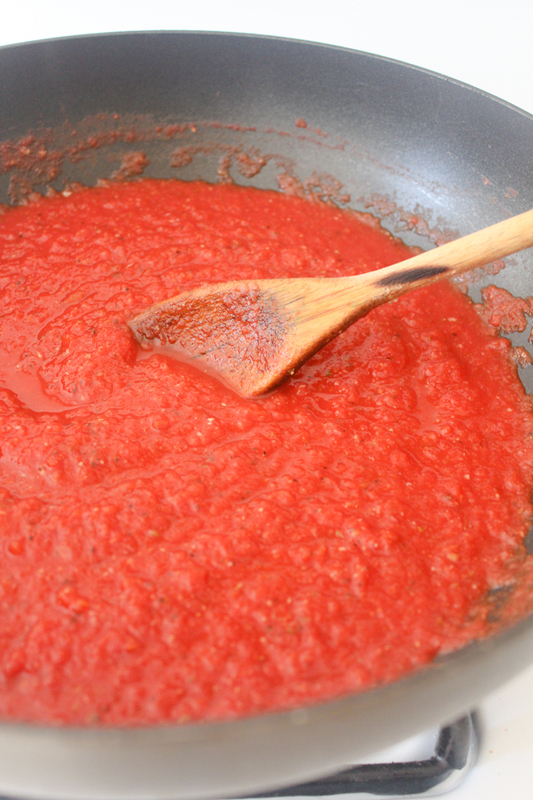 - To make the sauce: heat olive oil in a large skillet (do not use a pot). Add the garlic and cook for about 1 minute. Add the white wine and cook on high heat until most of the liquid has evaporated, about 4 minutes. Stir in the tomatoes, basil, oregano, salt, pepper. Cover and simmer on low heat for 15-20 minutes. - To make the Cashew Parmesan: while the sauce is simmering, add all ingredients to a food processor and blend until mostly smooth with some small cashew pieces remaining. 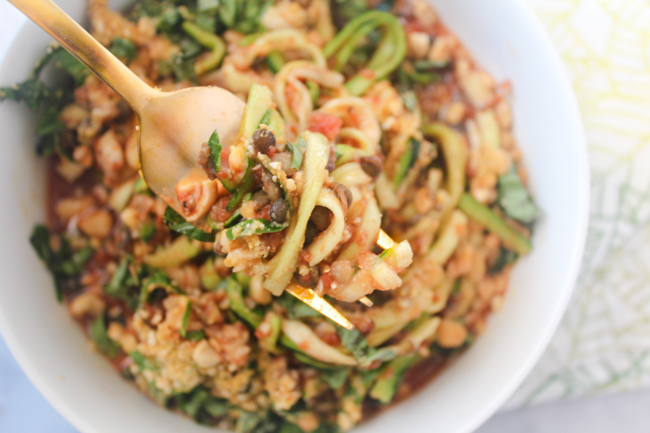 - Heat olive oil in a skillet, add zucchini and cook for about 3 minutes. Add the lentils and desired amount of sauce and cook another 3 minutes. 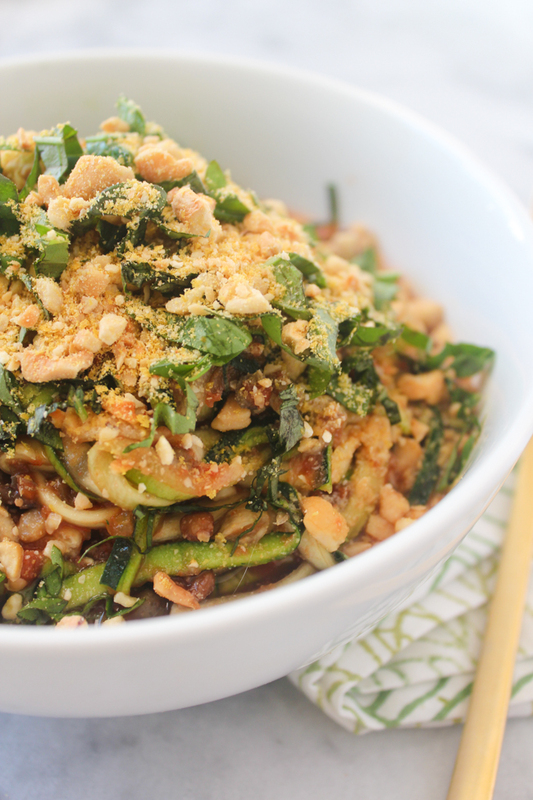 Garnish with fresh basil and Cashew Parmesan. OMG, this looks so yummy. I love zucchini so I may actually have to try this out. Yes! 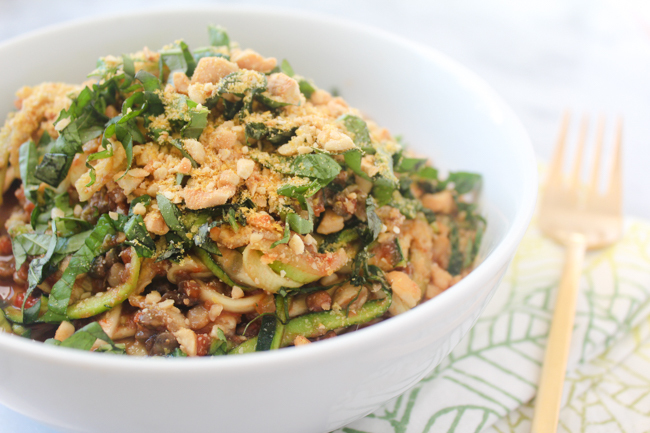 Zucchini is one of my favorites as well, let me know what you think! Wow this looks so good. I'll have to try this dish it sounds delicious. looks yummy! I would definitely try this!! this looks so yummy and healthy. I don't cook. but im def gonna pass this recipe off to someone that does. so I can try this delicious looking meal. Yes! Please do and let me know what you think of the recipe. Even if you don't cook regularly, you could totally make this yourself too. It's super simple and feel free to ask any questions! Oh yay! That makes me so happy :)) It's one of my favs as well!